This royal formula was created for what was most precious and beloved to the reigning king: the little princess Padmini. With no costs spared and using only the finest ingredients from lands near and far, we perfected this ultra-nourishing elixir to soothe and strengthen both her skin and mind. Centuries later, tales of Padmini's beauty and wisdom endureas do the legendary powers of this exquisite baby oil which is perfect as it is pure. This soothing and strengthening Ayurvedic formula works hard to support your baby's delicate skin and its development. Gentle doses of rose and sandalwood enrich the baby's skin with bountiful moisture, while calming redness and inflammation. Tea tree and geranium deliver rich nutrients creating beautiful, healthy skin that is equipped with strength for adulthood and beyond. Mandarin oil boosts circulation within the baby's body, helping overall muscle function and development. Hempseed, avocado and pomegranate oils further nourish, banishing signs of eczema and flakiness while lavender and chamomile produce a deeply soothing influence on the body and mind for a calm, restful baby (and mother!). Note: The concentration of essential oils in this blend has been kept lower than in the rest of our formulas, and is safe for topical use on babies and toddlers of any age! Always spot test new skincare on a small area of baby skin for allergies prior to full application. Essential oils of rose, sandalwood, lavender, chamomile, frankincense, tea tree, geranium and mandarin in a base of jojoba, pomegranate, hempseed and avocado oils. After the baby's bath, apply oil liberally in gentle circular motion all over the body, including the belly and back. 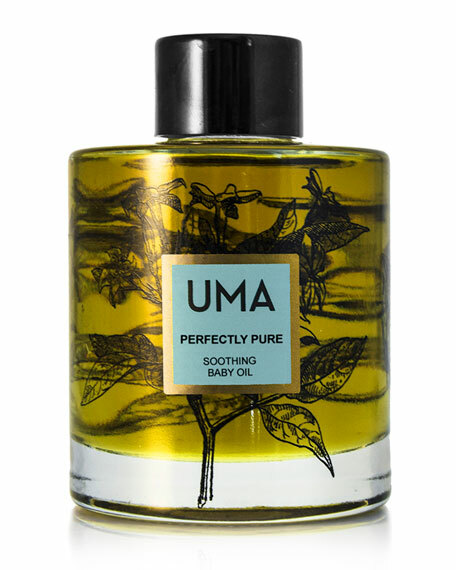 Massage into the skin using long and circular strokes until the oil is absorbed. Can also be applied to the baby's head and hair. Recommended length of massage is anywhere between 10-30 minutes. A daily massage can be a great bonding experience between the mother and baby. Researchers also believe that regular massages can enhance a baby's muscular development, circulation, immune system and motor skills.